Give the gift of vanilla for the holidays. This spice set includes homemade vanilla extract, vanilla salt and vanilla sugar – easy to make! I’m not going to be grinchy and post how many shopping days until Hanukkah or Christmas. But at the very least, there is still time to make some special and fairly simple homemade gifts for loved ones this year in your kitchen. Enter the Vanilla Bean Spice Set. I’m fairly embarrassed to admit it’s taken me this long to work with vanilla beans. 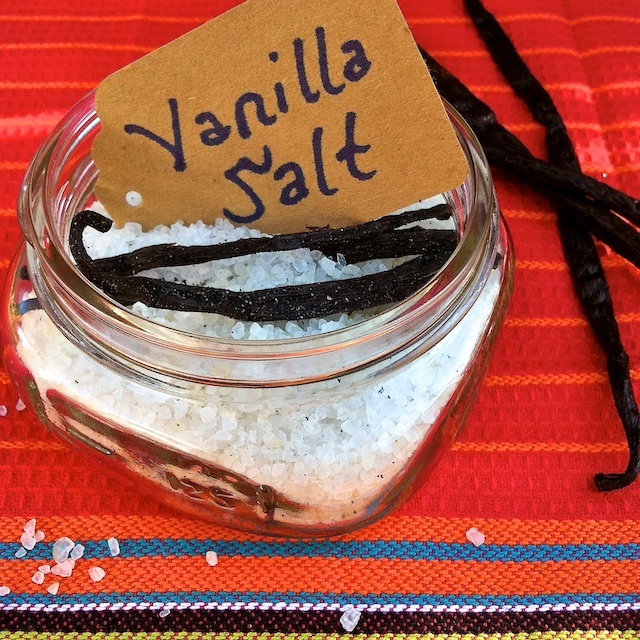 I’ve gone through dozens of bottles of vanilla extract without much thought but after listening to a fun and inspiring #SpiceChat (a super cool monthly Twitter chat co-hosted by Table Fare and My Spice Sage) all about vanilla, I was motivated. And here’s the beauty of these recipes: two ingredients (plus some time to sit) and you have vanilla extract. Two ingredients and you have vanilla sugar. Two ingredients and you have vanilla salt. Package them all together and you’ll have a very unique and special gift for your favorite home cook. Make your own vanilla extract, vanilla sugar and vanilla salt for your kitchen or as a gift spice set for your favorite foodie! For Sugar, split vanilla beans down the middle. Scrape out seeds and place in small bowl. Add sugar and mix thoroughly. Pour into container with lid and add vanilla beans. For Salt, spilt vanilla beans down the middle. Scrape out seeds and place in small bowl. Add salt and mix throughly. Pour into container with lid and add vanilla beans. 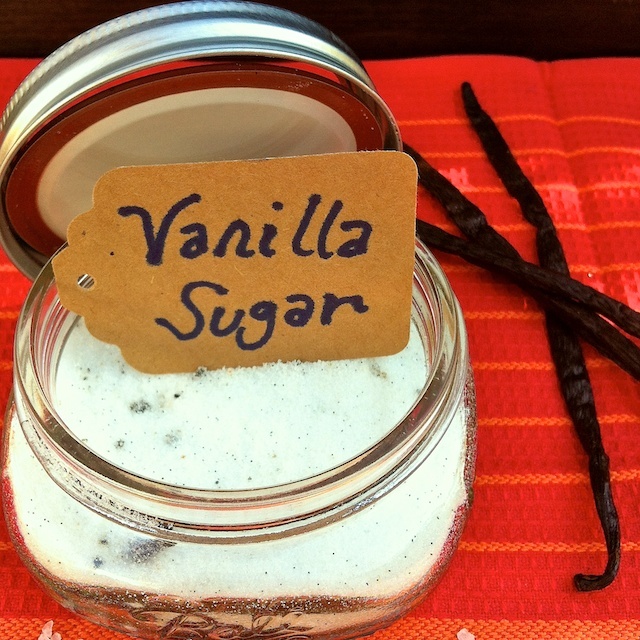 Do you cook with vanilla beans? Do you have a special “made in my kitchen” creation you like to gift? Love the idea of giving the three together as a set! And your tags saying how to use them are a great idea too! Thanks Kelly. I sure learned a lot (esp. about vanilla salt) when researching unique ideas for using vanilla in recipes. My sister and I make something each year for gifts….this might be our 2012! Last year was pumpkin salted caramels! Thanks! Great ideas . . . I’m seeing the vanilla salt on top of my usual toffee. Such a beautiful, fantastic idea! Gorgeous photos, too. I wonder if there is a good coconut palm sugar variation (?) Ideas? Tiffany – while I haven’t baked with either coconut or palm sugar, I’m sure you could swap them in place of the cane sugar with similar results. I have been looking for Christmas gift ideas and these are perfect! Thank you for sharing. I will always accept the gift of vanilla! Yum! Great ideas!